Columbus Museum of Art offers a variety of experiences for family audiences, plus free admission for Children 5 and under. Family experiences include Young Child Studios, Open Studio, Homeschool Workshops, Summer Art Workshops, Family Adventure Tours, the Wonder Room, Big Idea Gallery, Museum on the Move, and more. Look for great works of art and many unique, hands-on activities in the Big Idea Gallery. Explore, play, and imagine with others in the Wonder Room, an immersive and experimental gallery experience. Embark on a scavenger hunt, imagine yourselves inside a painting, or discover a work of art that tells a family story during Family Adventure Tours. (Check the calendar for times). 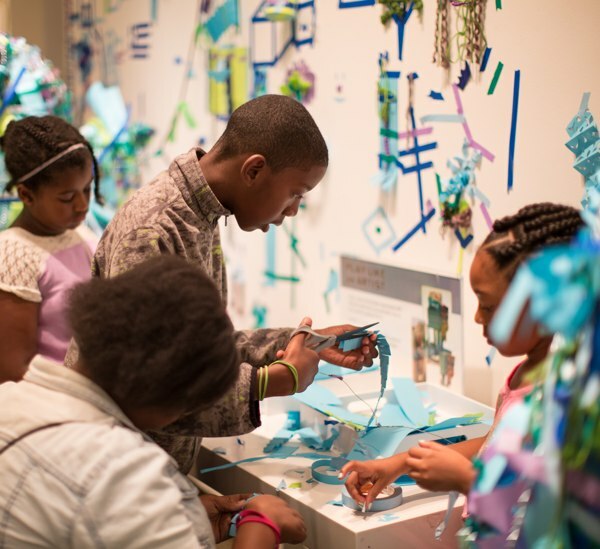 Explore art throughout the Museum galleries through hands-on activities, puzzles, and Join the Conversation stations. The Studio is a place for visitors to experiment, play, and explore with imaginative ideas and unexpected materials. Visitors of all ages are welcome to drop in to the Chase Center for Creativity Studio to engage with new ideas, solve creative challenges, and collaborate with friends, family, and CMA teaching artists. Open Studio is every Saturday from 1:00-4:00 PM and free with your entrance fee and always free for members. Young Child Studios are hands-on workshops for children 18 months to 5 years. Caregivers and children talk, play and think creatively together. CMA’s artist educators have designed many opportunities to experiment with materials and ideas in unique environments. This program is drop-in; no reservations requested. For specific dates and times see the Events and Programs page or call 614.221.6801. Summer Art Workshops at the Columbus Museum of Art provide playful and creative opportunities for students entering Preschool through 8th grade. Each workshop includes lively gallery games, dramatic and imaginative exercises, a variety of art materials, and unique art projects. Check out the offerings and register for 2018 Summer Art Workshops. CMA offers workshops specifically for home school families. Each month features opportunities to explore a topic inspired by a big idea. The workshops are offered once a month on Tuesdays from 1:30 PM – 3:30 PM, for homeschool students ages six to 13. Registration includes opportunities to explore the Museum, Studio Thinking Workshop, and Museum admission for the student and one accompanying adult. Parents may choose to drop-off or remain with their child; siblings under the age of six are welcome for free. Registration is $10 per student per workshop for nonmembers, with a special member price of $8 per student per workshop. 2018-2019 Homeschool Registration. A Columbus Museum of Art birthday party offers a hands-on experience with art! With a choice of engaging themes for kids ages 1-11, each party includes admission to CMA, gallery games and adventures, costumes and decorations, an art-making activity, and take-home creativity kit! Learn More. Museum on the Move! is a community outreach program that provides hands-on art activities at local festivals, fairs, libraries, and other cultural events. Look for Museum on the Move! to visit an event near you.